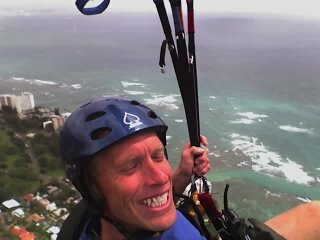 In order to take advantage of the incessant rain and light southerly flow I have taken to hanging around Diamond Head. I know that brings to mind images of creepy dudes lurking about with that all too eager "Hi!" and the funny stare. Okay, so I might look like that, walking back and forth with no apparent agenda, but I did have a large backpack on which somehow makes it alright. Yesterday, after talking to Mike Doyle about conditions, I launched into the southeast flow. I managed to scratch around for about an hour above the rim until the wind swung east and waned. I was just happy to get a little flight time. Today, started out rainy and still so once again all work was cancelled. By 10am I noticed the trees moving briskly from a SSE direction. Off to Diamond Head and the path launch to find the trees had gotten taller and the wind seemed too west. I headed off to lunch while Bob came by and checked conditions and gave it a pass. After lunch, I came back and saw a squall out east bringing the flow stronger and more straight in. I launched into strong slightly westerly conditions and had to work my way up on the other side of the lighthouse. I climbed my way to 1000' into very strong smooth air. About this time some big and low squalls were bearing down on me. I figured I would head over to Kapiolani Park to sidestep them and maybe soar Waikiki if it looked good. The wind was 25 or more over Kapiolani Park and I couldn't escape the fact that I was downwind of the 15 story Colony Surf and all the other buildings there. I found myself bouncing down the last 200' or so. I land at the biggest LZ in town and it turns out to be the bumpiest. On top of that the black squalls with their opaque walls of rain decide to follow me there. 30 seconds after I land the squall does the same. I waddle off to the nearest cover, which happens to be the bathrooms, and an all too neat Parks and Rec. guy informs me that I cannot "practice" paragliding in the park. I inform him that I am finished "practicising" for the day and apologize for the hassle I have caused. The rain stops, I stuff my glider in the bag and I walk 300 yards and the ground is dry, I then realize that I flew into the path of the rain and I could have stayed dry in the air up top. Don shows up, and I relaunch into lighter and more cross conditions, I am scratching away on the Funky when the people at the Lighthouse step out on the deck to watch. Aware of past episodes there I scratch around for a while and the people at the Lighthouse start returning my waves. I then fly past to the other side to work the better lift there I steadily climb for a while, until the lift starts to fade, I then head back over to launch side to scratch for way too long in fading conditions and effectively block Don from launching (Sorry Don). Eventually the lack of rising air and my ADD kick in and I sink out to the beach. Then all my flying buddies show up and stand around with me, I even take a quick sledder to the beach (and the waiting naked guy) on their behalf. All I have to show for the day is this goofy phone picture that comes out reversed. Anyone up for Friday? Dave, great story. We've always known that Diamond Head rewards those who are on the spot to take advantage of brief windows. I'm glad you have started to take some flying pictures in your old age. Your gonzo flying style allows you some unique perspectives that we all enjoy sharing with you. Even on a cameraphone with all the quality of a convenience store security video. I guess I know what we need to get you for your birthday! I actually thought the picture was not reversed, and that you were on the far side of Kapiolani Park, but I couldn't quite make sense of the houses in the shot from that point of view. Alex, I have a camera in the ashtray of my van, I need to get it into my harness. I also need to find the data cable. My cell phone shoots mirror image with the cover closed, open it is normal. I guess I need to fly with friends with cameras more. Yeah.